March has been a really busy month for me and a bit of a stressful month. With so much going on, it was hard to find time for myself, but I forced it in just to ensure I didn’t go crazy. With those little bits of time for myself, I was able to find a few new favorite items that I came to adore during the month of March. Essie Mint Candy Apple – Spring is here and so are Spring nail polishes! I practically dragged my sister to Walgreen’s so I could pick up the beautiful shade of Essie’s Mint Candy Apple nail polish. They describe the color as a creme de menthe mint, which to me just means a pretty pale green, like a stick of spearmint chewing gum. After I bought it, my sister and I decided to give ourselves little at home manicures and the color looks fantastic with both of our skin tones. Planner Stickers – I have been totally obsessed with my Erin Condren planner since the moment I got it. I love decorating my days in each little block and getting myself pumped up for the fun events I have coming up. My new obsession lately has been searching for the perfect stickers to decorate my days on Etsy. They literally have stickers for every single occasion, which is perfect for me because I like to celebrate everything, no matter how big or small! J.Crew Factory Fluted Skirt – I have raved about my love of these skirts before and I probably will again. They are the perfect accessory for any work wardrobe and they can be dressed up or down really easily. I was so worried that since all the shades of the skirt were so dark, that I might have to pack them up until next fall, but I was in luck when J.Crew came out with some bright, new shades of the skirt for Spring! They come in a few fun colors sure to brighten my workday mood. The Mortal Instruments Book Series – I have read the entires series at least once or twice before, but I picked it up again randomly a couple weeks ago and read through each rabidly. I remembered why I enjoyed the series so much. It focuses on a redheaded girl named Clary who discovers a secret world of warlocks, wearwolves, vampires and shadow hunters (part angel & part human). It is such a fascinating read and perfect for those who loved the Divergent and the Hunger Games series. Wen Sweet Almond Mint Conditioner – My hair has gotten ridiculously long lately and I think I’ve just now started to notice. I really need to get a proper hair chop, but I’ve been so busy that I haven’t found the time yet. This means my ends are running a big ragged and to keep the split ends and snarls at bay, I’ve been using Wen Sweet Almond Mint conditioner. It not only smells amazing, and it really does, but it does the absolute perfect job of bringing a bit of moisture into my hair without making it overly greasy. Definitely a necessity with my hair at this stage! What are some of your favorites from the month of March? Share with me in the comments below! I love that orange skirt! Fun pots , your blog is cute! I really want to try the Wen hair products too. I need to get a hair cut as well. Spring is always a good time for that. I LOVE that skirt and the mint nail color. Essie is the best! Wen is so great! Out of the permanent line, I like Pomegranate best, but the seasonal Winter Vanilla Mint scent is AMAZING. It smells like a Starbucks latte! 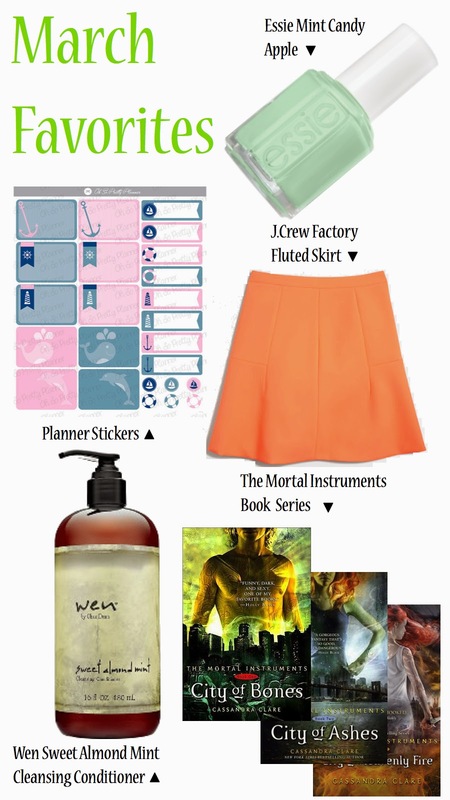 I adore and want everything on this list! I have a Erin C desk calendar that could use some stickers too!! I love love love the Mint Candy Apple color! I just can't seem to stop looking at my nails when it's on. Seriously though, I'm starting quite the collection!